In 1965, Beatlemania was at a fever pitch, and the typical set list for the tour included an opening cover of the Isley Brothers’ “Twist And Shout” as well as “A Hard Day’s Night,” “Ticket To Ride,” and “Help!” (There were also more than a few old rock and roll covers in addition to the Beatles originals.) The audience in the footage available on YouTube does appear to be predominantly the aforementioned screaming females of all ages, but there are more than a few guys and girls there who probably went on to purchase Rickenbackers and Hofners in order to form their very own power-pop band. The sound quality of the performance is by no means perfect, but it gives a good idea of what a powerhouse live act the band was, particularly when performing on that tiny stage in the middle of a baseball field, without the assistance of a gigantic video screen of the kind audiences see at today’s stadium shows. After the shows, John, Paul, George, and Ringo visited Margie’s Candies on Armitage and Western before retiring to the Sahara Hotel in neighboring Schiller Park. The August 20th, 1965 Comiskey Park double-header attracted 50,000 fans; tickets were going for $5.50 cents. Comiskey Park, home to the Chicago White Sox, would later be the site of local DJ Steve Dahl’s “Disco Demolition” night that erupted into a riot on July 12th, 1979. “Old” Comiskey was torn down in 1991 and replaced with U.S. Cellular Field. 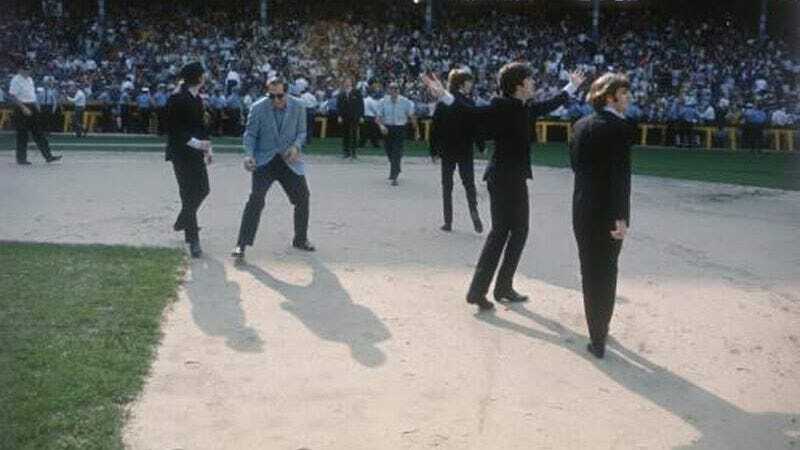 The Beatles had played the International Amphitheatre in Chicago the previous year, and would return in 1966 to play their final Chicago show at the same venue. After the 1965 tour, The Beatles would take a six-week break before recording their sixth album, Rubber Soul.